Harvey Robinson (“The Historical Point of View”) wrote: “It is clear that all our information in regard to past events and conditions must be derived from evidence of some kind. This evidence is called the source. Sometimes there are a number of good and reliable sources for an event … Sometimes there is but a single, unreliable source.” He continues to explain that we not only lose a sense of reliability of the event, but what do we truly learn from just one source? Sarah Copper had her class define primary source as point of view. The students, middle grade, knew that a primary source was something written by someone who was at the event, (single point of view) or an eyewitness. Sarah brought in a jade lion and asked the class to tell her about the person who owned this jade lion and the society around it. The answers varied as can be expected: “A lion trainer owned the real lions, a zookeeper, and a tourist bought the lion.” Three different perspectives. This got me thinking: Philosophically speaking: Do we as writers deny the reader a deeper essence of knowledge (of a character, or scene, a lion statue) of the story by limiting the story to single POV? Doesn’t the multiple POV give the reader more perceptions into the story, therefore touching more of the readers’ own beliefs—helping them see a richer and different perspective by showing them multiple views on one subject?Of course it does, some readers might say. Some writer’s might respond that delving into the single person, from that specific point of view, gives the writing the intense depth and passion enriching the character and the story. However, I’m thinking more from the angle of what does the writer owe the reader. Some authors say that writing from the first person is easier and they still deliver a wonderful story–the true goal of writing. I guess this just boils down to individual preferences and an internal guideline of author’s ethics. This entry was posted in Uncategorized on March 31, 2013 by trow125. Writing a play in six hours and having it performed in twenty-four? YES! 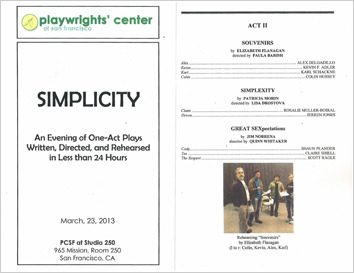 I was selected to write a play for the Playwrights’ Center of San Francisco’s (PCSF) 24-Hour Playwright Festival, performed on March 23, 2013 at PCSF’s Studio 250 Theater. The production was a charitable event to support PCSF and included seven one-act plays comprising the Saturday evening format. All plays were written, directed, and rehearsed in less than 24 hours. The theme for the Festival, Simplicity, was chosen at random at 9 PM on Friday the night before the performance. All scripts had to be written and submitted the next day by 6:30 AM. The number of actors and the directors were also chosen at random. The play I wrote, titled “Simplexity,” is a short, humorous play based on a random meeting between two college students at the campus coffee shop, Cafe 101. Claire, an art major, who just received a poor review of her painting from her art professor, is hysterical, and interrupts Devon, a lit major, talking on his cell phone while trying to make a deal to write another college student’s lit paper.Claire brings the complex to the simple in her art, and Devon believes he brings the simple to the complex in his writings for other students. 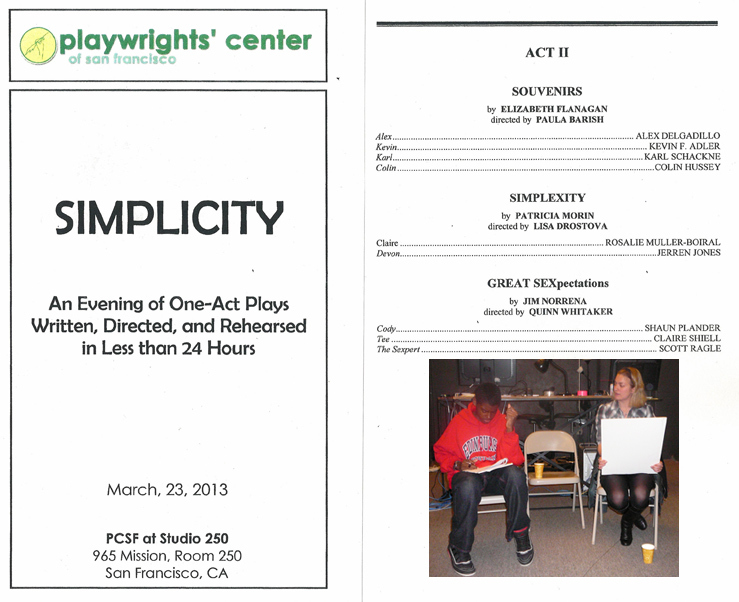 “Simplexity” was wonderfully directed by Lisa Drostova and the play was brought to life by two very talented actors: Rosalie Muller-Boiral, who played Claire, and Jerren Jones, who played Devon. You can view more information about the event here. It was one of the most exciting adventures in my life. Electric, yet exhausting. As Lisa, the director said to the actors: You made the audience know what fun is! The audiences roared with approval for the actors, the director and for moi, the playwright. I will discuss, in another post, the changing POV of a play, and the playwright’s dilemma in hearing the real voice on the stage. Thank you so much for visiting and sharing in my joy! This entry was posted in Uncategorized on March 29, 2013 by trow125. 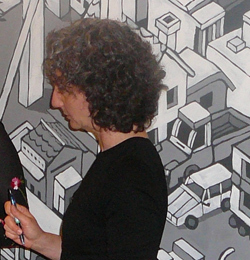 When I spoke to her about my post, we discussed the similarities in our art forms. And we came to the same conclusions about the beginning and the ending of the creative process. In the beginning, we have to learn our craft. Then, we decide what we want to say about that craft that is unique to us. Pieces of our work are created, polished, and our ending? This entry was posted in Uncategorized on March 16, 2013 by trow125. What do many writers have in common? A diversity of knowledge? Lots of research books? 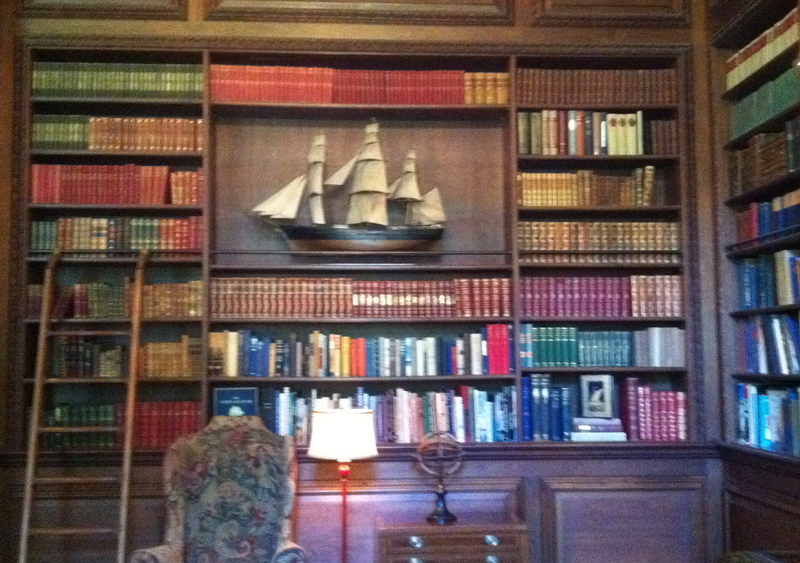 “How to” pamphlets and magazines and books crammed into shelves and crevices and piled high near walls? Did you say, “all of above?” I bet you did. The amount of research we writers accumulate could earn us several degrees. I often say my favorite books are the dictionary and the thesaurus, basic details for the beginning and advanced writer. But really, for each individual we introduce, each career, we do our own background checks and bios. For my last short story I read two books, part of another, and a few articles as references: Psychic Discoveries Behind the Iron Curtain, Remote Viewing manual, Are you Psychic? (I’m not), and some here and there articles about telepathy. For the characters in my novel, I’m back at accumulating details– have a lawyer, Ronnie, who studied at NYU. I looked up the civil law in NY and CA. I read about about landmark cases in women’s rights. Sam, another character, is savant-like. So I read David Tammet’s stories, two books about being a savant: Born on a Blue Day and Embracing the Wild Sky. Actually, the second book says a lot about our evaluation of intelligence. So I have Sam just retired from a very lucrative business of alternate intelligence and trade testing for corporations and schools. That’s just the beginning. Anyway, you get the picture. We are a well-learned lot. Details are our business, learning them, picking out the best to choose for the story, not giving away or weighing down our work with them, and, most importantly, unfolding them into interesting reads that keep the eyes wandering along our many pages. This entry was posted in Uncategorized on March 2, 2013 by trow125.